Beginning with SAP® version 4.0, you can use the Security Audit Log feature to record security-related system information, such as changes to user master records or unsuccessful logon attempts. This log is designed for auditors who need detailed information about what occurs in an SAP system. By activating the audit log, you keep a record of all of the activities that you consider relevant for an audit. You can then access this information in the form of an audit analysis report. 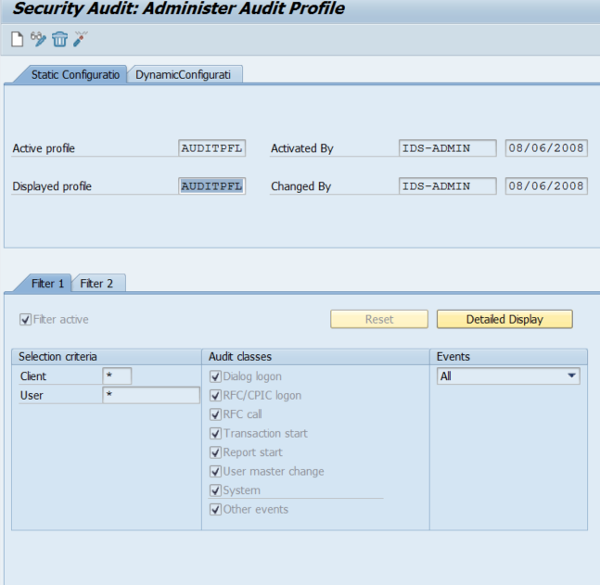 This blog helps you activate your SAP Security Audit Log. SAP's Security Audit Log feature is designed for long-term data access. The data is stored in the control block, which is located in the application server's shared memory. The system retains the audit files until you explicitly delete them. While you currently can't automatically archive the log files, you can manually archive them at any time. The tables that are accessed for the audit information are from the cluster tables and cannot be viewed by the SE16 or SE16N transaction code. They must be accessed through these transaction codes or the ST03N transaction code. 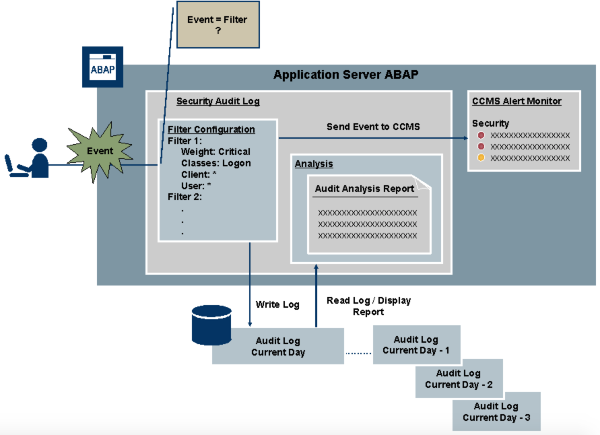 Image source: SAP, The Design of the Security Audit Log. You specify the information that you want to audit in filters that you create. The filters are permanently saved in the SAP NetWeaver Application Server (AS) Advanced Business Application Programming (ABAP®) database in static profiles. All of the nodes in a cluster use identical filters to determine which events to record in the audit log. However, you want to create profiles for different auditing scenarios. Once activated, the AS ABAP loads the profile when the AS ABAP starts. The AS ABAP uses the filters that you define in the profiles to write events to the Security Audit Log. You can change the filter settings that are currently in use without having to restart the AS ABAP. The system distributes these changes to all active application servers. This procedure requires you to restart the AS ABAP. Plan for the required downtime while the AS ABAP restarts. To configure the type of security audit that you want to run, create a filter and specify the information that you want to audit. DIR_AUDIT: The directory where you want to save the security audit files. FN_AUDIT: The name of the security audit file. Note: You can set these parameters as profile parameters in the application server's instance profile. However, we recommend that you set the parameters dynamically as kernel parameters in the Security Audit Log configuration (transaction SM19 in the Kernel Parameters tab). After the kernel parameters are set, the system ignores the profile parameters in the profile of the application server, with the exception of DIR_AUDIT and FN_AUDIT. If you want to transport the kernel parameters to other systems in your landscape, select the icon that looks like a red vehicle. The Status should now be active. Note: The generated logs require enough resource space to run. The Security Audit Log is a tool designed to help auditors and SAP security professionals review what occurs in an SAP system. The audit files are stored on an application server that needs enough space to run on daily basis. You can access the log information in the form of an audit analysis report. To learn more about Rackspace SAP ERP services, see Managed Services for SAP ERP Applications.